Thailand’s renowned 808 Festival is expanding to Myanmar for the very first time for a massive 2-day EDM event. Headliners include Dutch electronic heavy-hitter Hardwell, Dim Mak’s Dillon Francis, American-Guatemalan trap star Carnage and Dutch DJ duo Yellow Claw. 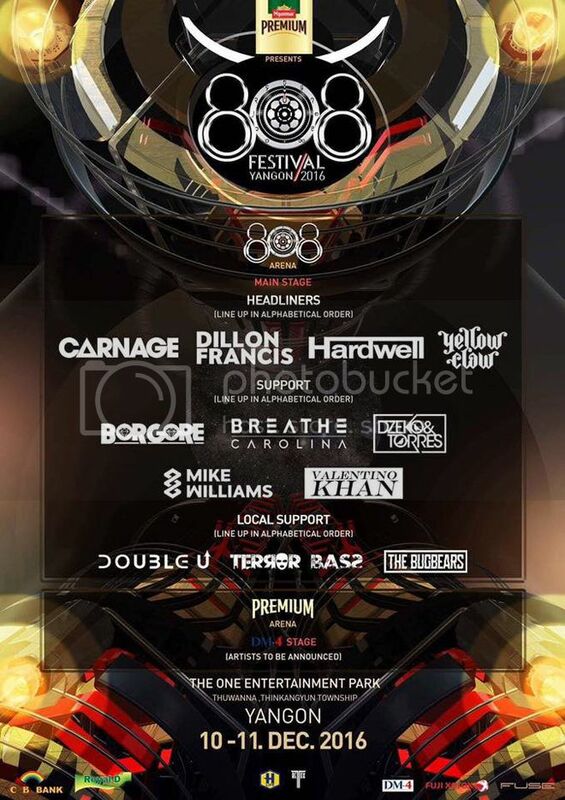 Also announced are international acts like Mike Williams, Borgore, Dzeko & Torres, Breathe Carolina and Valentino Khan, as well as local DJs Double U, Terror Bass and The Bugbears, who will play on two different stages. More acts are said to be announced soon. 808 Festival will be the first festival ever in Myanmar to host a line up of this scale, and we’re definitely excited to see how things turn out, as Myanmar’s electronic music scene, compared to its neighbouring Southeast Asian countries, is yet relatively undeveloped.